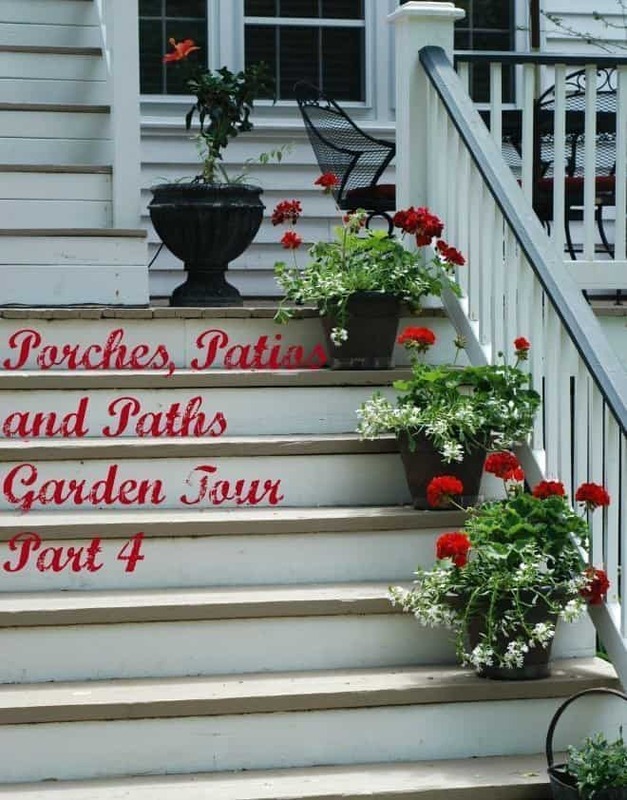 Welcome to Patios, Porches & Paths – Part 4! Did you miss part 1, 2, or 3? Just click on the corresponding number and go straight to it! 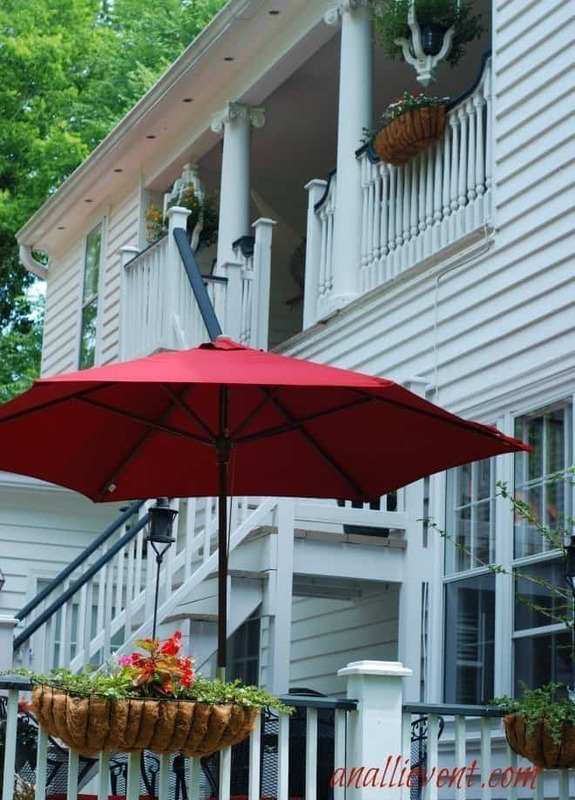 House #4 is one of the oldest in Cheraw and according to my helpful little brochure (since I don’t actually live in Cheraw, but now wishing I did), The Watson home has been the site for several of the Taste of Cheraw events. And I’m going to make sure I attend the next one! Another large old oak provides shade over the former law office of South Carolina chief Justice Henry McIver. This addition was moved to it’s current site after Captain McIver returned home from the Civil War. 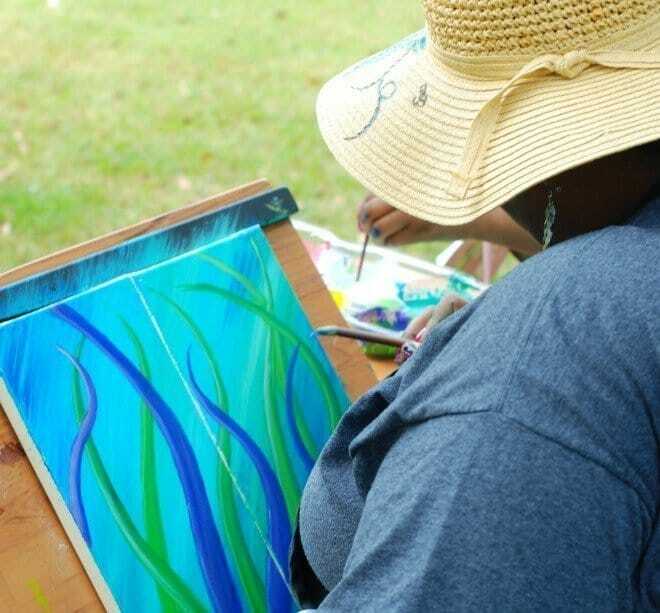 When we approached the house, we spied another artist, so we headed over in her direction to see what she was working on. As I was looking at the picture I took, I noticed that I captured a tiny dot of paint falling from the paint brush. Can you see it? The porches of house #4 were decorated beautifully! Who wouldn’t want to spend a morning (or all day) in this swing? After meandering around the porches, we headed through the grounds toward the back of the house. We discovered a lovely deck tucked around back! What a perfect place for that first cup of coffee every morning! And what about this original smokehouse? We don’t see too many of those around anymore. 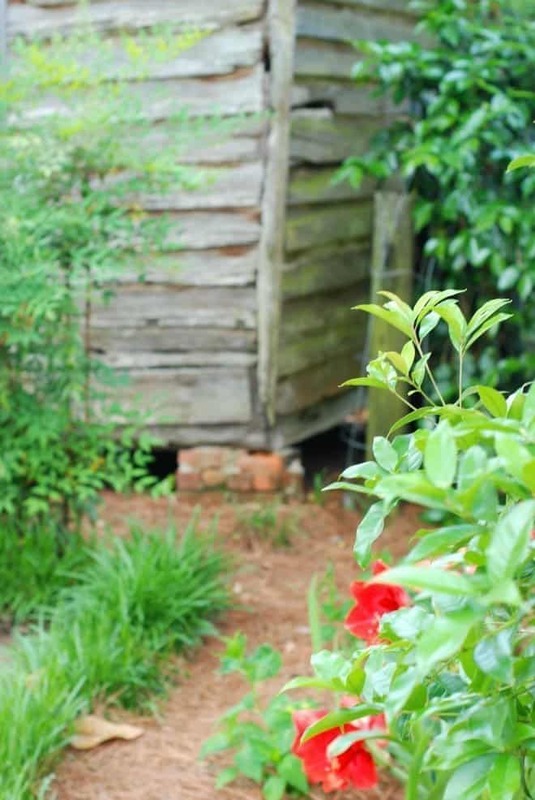 And last, but certainly not least, the garden shed! I’ve only got two more parts of the garden tour left! I really enjoyed the tour and hope that you are loving it, too! 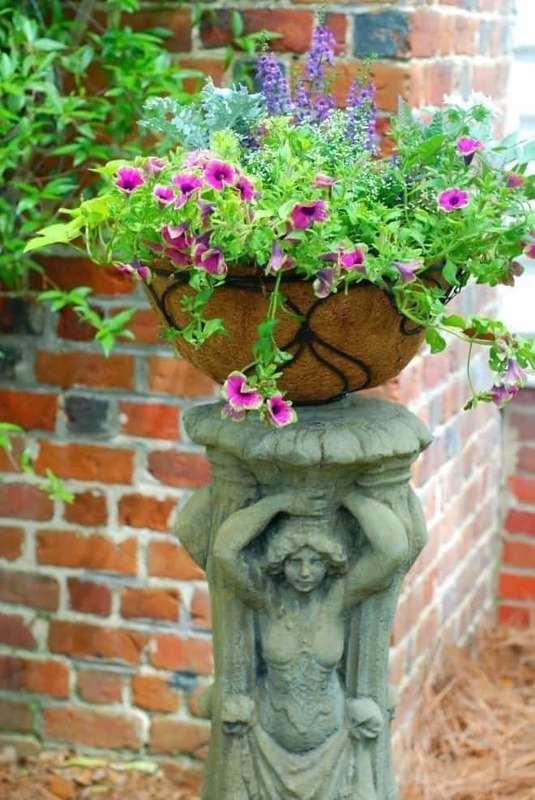 I love this porch – there is something so feminine and livable this porch/yard. I think it’s my favorite! 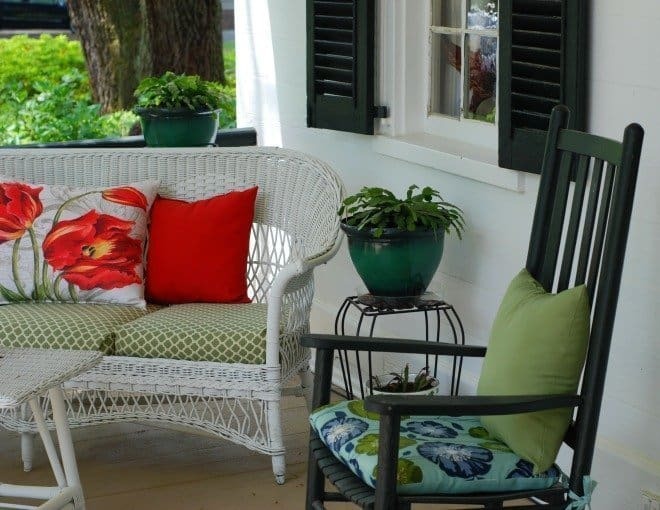 I can see myself curled up with a good book on that porch! I have been inspired to share my journey with Huntington’s Disease. I would be honored if you would follow as i share my heart. Thanks! I’ll be stopping by your blog soon! Oh! I am so happy I found you on Google+! 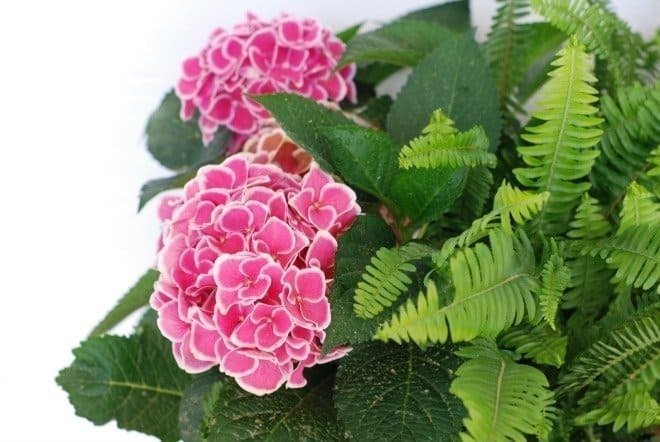 I have shared and I am now following you via twitter, Facebook & bloglovin. I find your blog post so relaxing. I could read on that swing for hours. Enjoy your weekend. Thanks, Lisa! I’m about to go check out your blog and make sure I’m following you! Ugh, a two-story porch?? My heart can’t take it! 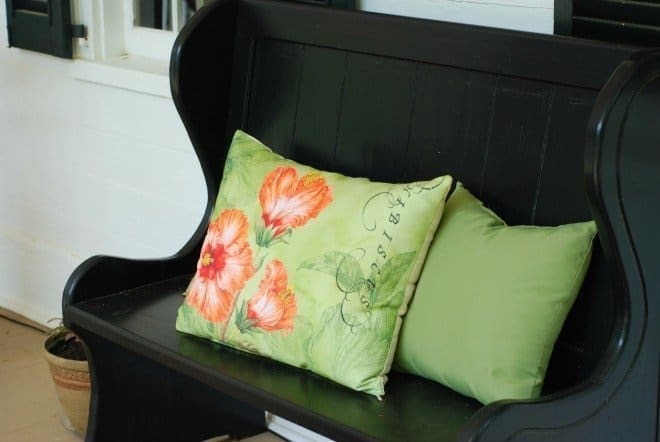 Those floral pillows are amazing. I’m in love!!!! Me, too, Addie! I’ve got so many ideas swirling around in my head! I love that porch on the second floor! I would love to spend time reading, drinking coffee or having dinner out there. Great series! I thought the same thing! Just when I thought the front porch was the star attraction, I rounded the corner to the back of the house and that’s where I would spend much of my time. Another beautiful, relaxing home! 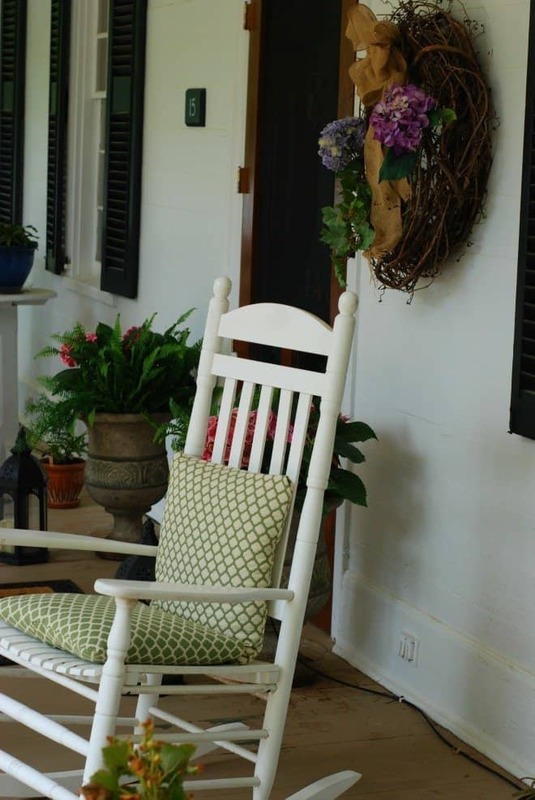 I could see myself out on the porch drinking sweet tea and reading a good book, or maybe blogging on my lap top! LOL! Working hard to develop our back porch into a fun hangout/pretty space! Love these. Kaitlin (also the name of my youngest daughter, Caitlin), I loved reading your love story! It was captivating! So funny! My friend that’s getting married next weekend is Caitlin haha. There were 8 of us in our graduating class in high school, and none of us spelled it the same. These porches are so pristine. How does one keep it magazine ready? Neatly-Packaged recently posted…TBT: Thunder Cloud Subs! Glad to see your page is working now! That sub looks amazing! Somehow I missed 2 & 3 but I went back to catch up – so awesome!! 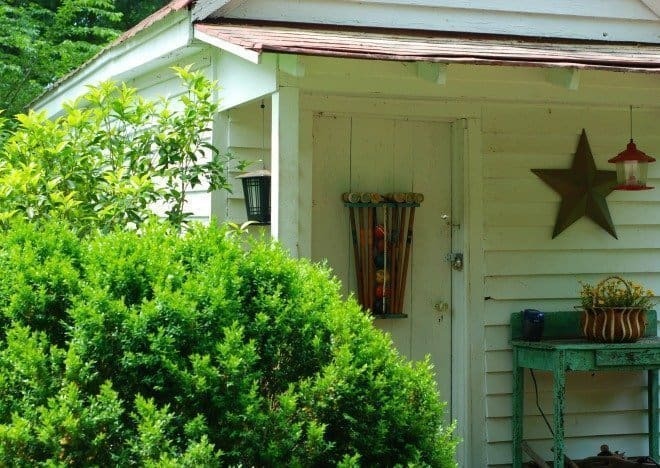 House #3 is my favorite – I love that yard!!! I loved them all, Kim! 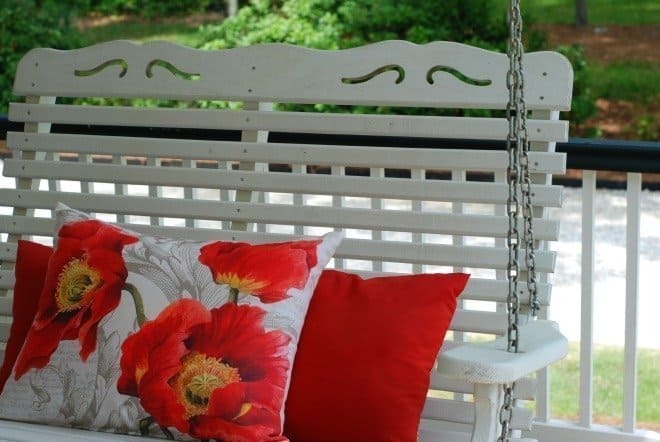 Red geraniums, porch swings with pretty pillows, big oak trees, beautiful lawns and big red umbrella’s, the only thing missing is ME! Love this house!